Cost visibility is one of the key areas which is deeply observed and analyzed by most of the organizations. This is because minimizing the cost remains the primary objective for all of the organizations. In today’s scenario, organizations require a cloud management solution that can do the entire monitoring and alerting job for them if something goes wrong in their cloud infrastructure. Having granular insights into your AWS EBS cost proves to be a crucial aspect as far as cost monitoring is concerned. This helps you in analyzing what all resources are currently running in cloud infrastructure and the cost being incurred. 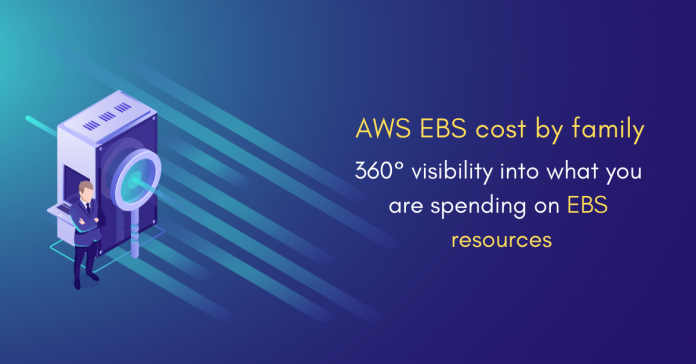 Why you should have visibility into your AWS EBS cost by family? AWS EBS has various product families which categorize the type of EBS services that you use such as storage, snapshots, system operations, etc. Managing EBS costs becomes a difficult task when multiple line items and resources pop up on your AWS bill. The worst part? – you discover some hidden costs at the month’s end. Centilytics provides “EBS Cost by Family” insight which categorizes your EBS related resources currently running in your cloud infrastructure under families. This insight also shows the cost corresponding to the services and resources. Hence, users can easily analyze their cost with the help of our tabular representation, graphical (pie-chart) representation or both. To know more about Amazon Elastic Block Store (EBS), read here. Product Family: This column displays the AWS EBS product family which shows the cost distribution of your total cost spent on EBS related resources. Unit: This column shows the measuring unit of your EBS volume storage. Cost: This column shows the cost corresponding to your EBS resources. Usage: This column shows the disk space occupied by your data in the respective EBS related resources. Resource Tags Value Applying resource tags value filter will display data which will have the selected resource tag value. For e.g. – Let’s say a user has tagged some resource by a tag named environment and has a value say production (environment: production). Hence, the user can view data of all the resources which are tagged as “environment:production”. The user can use the tag value filter only when a tag name has been provided. Discount Selecting this filter will display data after applying any applicable discount. Start date Selecting this filter will set a custom start date and data will be displayed accordingly. End date Selecting this filter will set a custom end date and data will be displayed accordingly. Time zone Selecting this filter will allow the user to view data as per a convenient time zone and is helpful in case of time and regional difference. Cost Type The user can apply this filter to choose between blended and unblended cost. A blended cost represents a unified cost that the user pays for a given service. It takes services such as S3, EC2, RDS, and several others into account. Whereas, an unblended cost represents a non-unified cost in which each type of usage with a specific rate gets its own line on the bill. Refund The user can apply this filter to choose between options to either include or exclude refund (if applicable). Currency Selecting this filter will allow users to convert their corresponding cost from one currency to another. By default, your cost is shown in USD (US Dollars). Use this filter to convert your cost from USD into an equivalent cost of selected currency. For e.g. – Selecting INR from currency filter will convert your US dollar cost to Indian rupee cost.